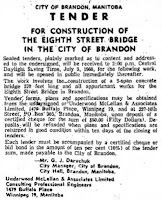 Earlier this month, the city of Brandon announced that the nondescript 8th Street Bridge will be demolished. The work is expected to cost $825,000 and should last from April to September 2017. The bridge, opened in 1968, is second 8th Street Bridge, to stand on this site. It was closed to southbound traffic in May 2015 due to condition issues, including a corroding expansion plate. It was closed completely to vehicle traffic in July 2015. There is still no firm plan to replace the structure. 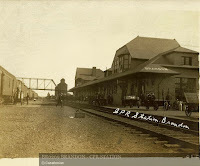 Like Winnipeg, the city of Brandon is divided in half by the CPR and the issue of providing sufficient crossings of the rail yards has often been contentious. 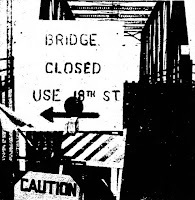 Many crossings have come and gone, though the current array of a 1st, 8th and 18th crossing have been around since soon after the first 8th Street bridge opened. The bridge actually crosses halfway between 8th and 9th streets on the south side. 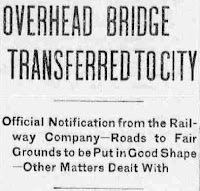 On the morning of March 19, 1903, Brandon's Mayor Hall and the CPR signed an agreement that would see the railway construct a vehicular bridge over their yards then hand it over to the city free of charge. The sweetheart deal was due to the fact that the CPR, controversially, wanted to close other, older crossings such as at 6th street. The bridge was 26 feet wide, 20 of that was roadway with a 6 foot sidewalk. The superstructure was made of steel with a wooden deck. The approaches were also of wood and the piles were concrete. Just getting out of the ground took a long time as piles were driven from 6th avenue to 9th. Due to it falling between streets, each approach had a dogleg turn especially on the north, Assiniboine Street, side. In January 1904, R. McManus of the Hamilton Bridge Works Co. of Hamilton, Ontario arrived to oversee the construction of the superstructure. 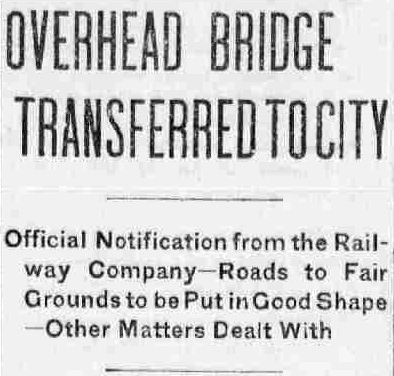 At the council meeting of July 18, 1904, a letter from the CPR was read to council informing them that the bridge was now complete and possession could be handed over immediately. The bridge served the city well, with varying amounts of maintenance and reconstruction, including the of its concrete piers around 1934. In the 1950s, though, age had begun to take its toll. Weight restrictions were limited and in 1957 the deck underwent major reconstruction with more work done in 1960. Akehurst requested that an engineering firm be brought in to do a more complete study of its condition and Underwood, McLellan and Associates from Winnipeg were hired. Their report warned of a number of dangerous conditions and major repairs that would be needed in what would ultimately end up being losing battle to keep the bridge open long-term. The best the city could hope for was fifteen years if they completely replaced the decking. The worst case scenario was no further life if the structure holding the deck in place was found to be too badly damaged. For good measure, the firm drew up plans for a basic concrete overpass as part of their study. A final decision about what to do dragged on for years. In August 1966, council voted, (with the mayor having to break the 8 - 8 tie), to take a chance on the redecking at a cost of $66,000. It turns out that the city faced the worst case scenario when the removal of the deck revealed rot in the structure below. 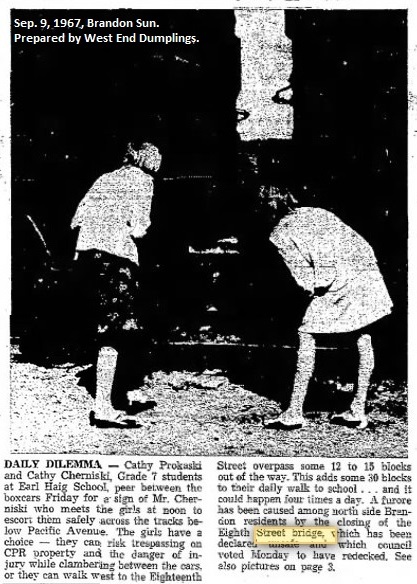 On September 5, 1966 the bridge was condemned. This left the city with a huge headache when it came to crossing the yards. By this time, the First Street Bridge approach's "temporary" closure had become permanent when the approach was removed. This bridge, now with no deck planks, was also impassable. That left the 18th Street bridge the only crossing in the area. A citizen named Wally Kaschor quipped in a letter to the Brandon Sun, “So, here we are with a city divided like Berlin." the closure meant that pedestrians, including children, chose to cross the busy rail yards on foot rather than take what could be a 30 or so block detour to 18th Street. The city's temporary solution was to lay a plywood pathway across the bridge structure for pedestrians to use. May complained that it was too narrow, slippery when wet, had no proper handrails and wasn't properly attached too the deck. In October, about 50 North End residents, including Mr, Kaschor, acted out a mock "opening ceremony" of the pathway. It included someone dressed as “the mayor” and two people in white coats carrying a stretcher across the pathway to symbolize the lack of access to emergency services that residents of the North End now had. To illustrate how narrow it was, two women coming from opposite ends of the bridge met at the middle to show that they could not pass each other. As expected, most people still chose to walk through the rail yards. A poll in October of three, two-hour peak periods showed that only 21 people used the path and 82 crossed the rail yard on foot. Of elementary school children, only 8 out of 20 elementary school used the pathway. Talks about what to do with the bridge resumed again in late January 1968. On January 29, council as a whole passed the recommendation of a special bridge committee that a new bridge, based on that basic model drawn up by Underwood, McLellan and Associates in 1963, be constructed. The new structure would be 270 feet long and built of five concrete spans.To save money, some of the existing concrete piers, which were only 33 years old, would be reused. 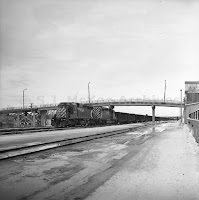 On February 5, 1968 the new bridge got final approval from council in an 8 – 2 vote. The detractors were Aldermen Berneski and Nickel, who said that reusing the old supports may still cause weight restrictions and would wear out faster than the rest of the structure. 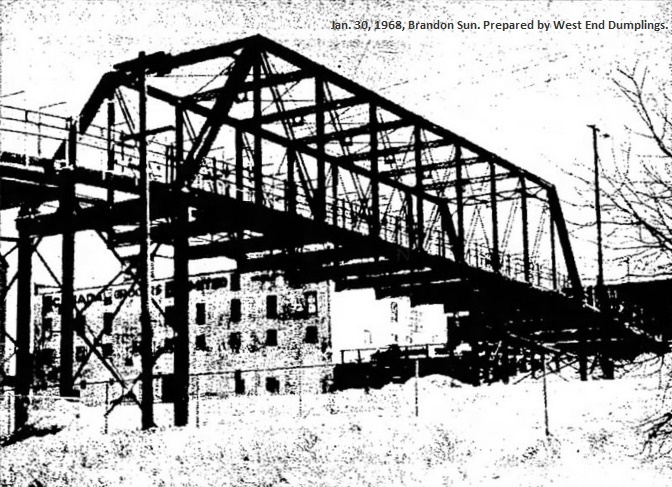 Berneski also noted the "unseemly appearance" of the bridge – a basic, concrete overpass. 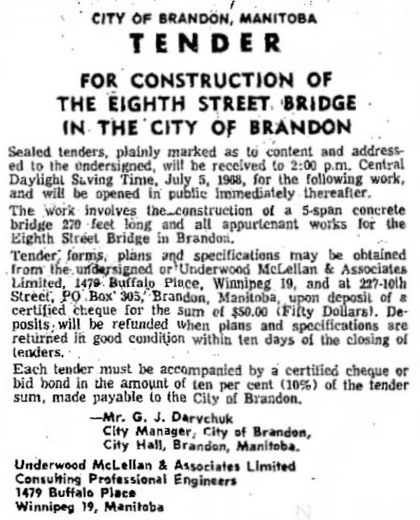 The June 1968 tender for the construction bridge was awarded to Claydon Company of Winnipeg won with the lowest bid of $305,000. Work went quickly, though did fall a few weeks behind schedule due to delays in demolishing the original structure. 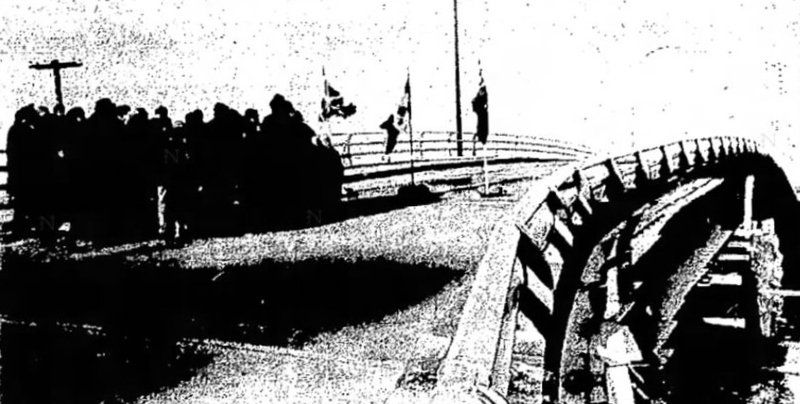 On December 23, 1968, Mayor S. A. Magnacca gave the citizens of Brandon an early Christmas gift when he and other dignitaries walked to the top and officially opened the bridge.